Winning its way into the hearts of children everywhere, the best loved children's book, The Tale of Peter Rabbit, by Beatrix Potter marks its 100th year in 2002. The author's story is just as intriguing. 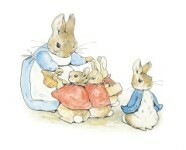 Helen Beatrix Potter was born at Kensington London in 1866. She was a typical middle class Victorian girl, educated at home by a governess. She kept a menagerie of pets and taught herself to draw and paint by watching her animals. She is unquestionably a figure of England's popular Lake District. It was here that she spent many summers exploring the countryside and painting plants and wildlife. Lake District woods, gardens, and views figure in many of her renowned children's books. However, other areas of Britain can rightly claim an influence on Potter's writings. Growing up, she made use of London's Natural History Museum, studying exhibits and making sketches of plants and animals. She also visited the Victoria & Albert Museum to look at the costumes, drawing ideas for fabric and colour from them. But it was the summer holidays in the countryside that provided the real impetus for the direction of Potter's abilities. Before her parents made the Lake District their permanent holiday destination, Potter spent Easter holidays at Ilfracombe in Devon, Lyme Regis in Dorset, Falmouth in Cornwall, Folkestone in Kent, and Hastings in East Sussex. The Tale of Little Pig Robinson contains drawings from many of these seaside resorts. Even Wales can lay a claim to Potter. She visited with her uncle who owned Gwaenynog Hall in Denbigh and later used his kitchen garden as the setting for The Tale of the Flopsy Bunnies. Gloucester is the setting for the second of Potter's books, The Tailor of Gloucester, published in 1903. After hearing a Gloucester folk tale of a tailor who was hard pressed to complete an order for the mayor, she turned the story into a book using a house near the Cathedral as the setting. In Birnam, Perthshire, an exhibition and a garden recreating scenes from some of her books are reminders of the 12 summers she and her brother, Bertram, spent roaming the wild Scottish countryside around Dunkeld, Birnam and Inver. It was in fact, from Dunkeld, in 1893, that she wrote the illustrated letter to a friend's son that was later turned into the best known and first published of her books, The Tale of Peter Rabbit. She began, “My dear Noel, I don't know what to write to you so I shall tell you a story about four little rabbits.” More picture letters followed and the children who received them were so thrilled by these charming stories that eventually she decided to publish one. 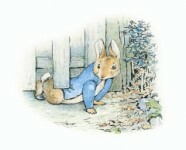 Like many an author of a best seller, Potter's book, The Tale of Peter Rabbit, was declined by publishers. Fortunately for future generations, she decided to self-publish the book. It soon gained a positive reception, and Frederick Warne publishers (to whom she had earlier submitted it) had second thoughts and published it in 1902. The book immediately sold thousands of copies and went on to become one of the best selling children's stories ever written. She was to go on to write 23 books in the series between 1902 and 1930. In 1882, on their first holiday trip to the Lake District, the Potter family rented Wray Castle on the west shore of Windermere. Beatrix Potter was 16 at the time. The house and estate, built in 1840 for a surgeon, Dr. Dawson, was inherited by his nephew, Preston Rawnsley. This association led to a life-long friendship between the two families. When Canon Hardwick Rawnsley, vicar of Wray and Crosthwaite, helped to found the National Trust, Potter became a supporter. In subsequent years the family rented what is now the Lindeth Howe Country House Hotel, overlooking Esthwaite Water. Potter purchased the home in 1913 for her mother who lived there until her death in 1932. In 1896 Beatrix Potter first saw and fell in love with the 17th century farmhouse, Hill Top, at Near Sawrey. She purchased it in 1905, using the proceeds from her book. Later she described it ‘as nearly perfect a little place as I have ever lived in’. She did most of her writing here (13 books, six set at Hill Top), but continued to live with her parents in London, visiting the farmhouse only when she could escape from their control. The house with its roughcast walls and slate roof contains her original furniture, china, pictures, and workroom. Its nooks and crannies and the cottage garden feature in many of her stories and drawings. The Tale of Tom Kitten, Jemima Puddleduck, and The Tale of Samuel Whiskers are three. Many of the cottages and shops of Near Sawrey were put to use as settings for her stories: the village store was the Ginger and Pickles shop while a former house and shop in the village, the Bend and Bump, starred in The Pie and the Patty Pan. Potter spent many happy hours roaming the fells and pathways around her Hill Top home. She often rowed on Moss Eccles tarn, and her rowboat is on display at the Windermere Steamboat Museum. When purchasing farm land with the proceeds of her books, she dealt with a Hawkshead solicitor, William Heelis, whom she married in 1913. His 17th century office is recreated along with a gallery displaying her original drawings and letters and information on her life in the farming community. After her marriage she moved into Castle Farm, near Hill Top, keeping her home at Hill Top as an unoccupied living museum. She more or less gave up her writing at this point focusing instead on farming and sheep raising. In the 1920's, she purchased land and Herdwick sheep, indigenous to the Lake District and known for their hardiness. Believing strongly in conserving the countryside of the Lake District, she next acquired Troutbeck Farm (situated by Kirkstone Pass) and the Monk Coniston estate that included Tarn Hows. Tarn Hows is, in reality, three tarns that were joined into one in the 19th century. Planted with trees on its banks, it provides a popular 1½-mile circular walking route. Potter spent time near Derwent Water at Lingholm, built in the 1870's. Red squirrels ran rampant in the woods around Lingholm and provided much sketching material and inspiration for Potter who spent the summer of 1901 here writing The Tale of Squirrel Nutkin (her third book). Lingholm's wicket gate and vegetable garden found their way into The Tale of Peter Rabbit. Potter also enjoyed the terraced gardens and rhododendron and azalea displays. The Newlands Valley was a nearby walking spot for Potter while staying at Lingholm. 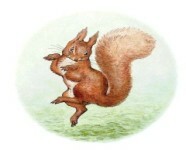 Her pet hedgehog provided first hand knowledge and a source for painting for the book, The Tale of Mrs. Tiggy Winkle. It reflects the Newlands valley scenes, Skelgill Farm, and Catbells. Another Lakeland garden that attracted Potter was Holehird, 1½ miles from Windermere, where she and her family spent two summers (1885 and 1889). Holehird mansion, a Grade II listed building, now serves as a nursing home. The ten acres of gardens sit on a hillside at the southern end of the Troutbeck valley, allowing spectacular views across the lake to the fells beyond. A walled kitchen garden, rock garden, orchard, heathers and shrubs make for a peaceful stroll. The garden has a national collection of astilbes, hydrangeas and polystichum ferns. 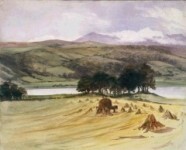 Fawe Park, a Lakeland summer home, presented further opportunities for Potter's sketchbook. Its landscaped and terraced gardens border on the shores of Derwent Water. A potting shed and greenhouses were grist to her mill, and The Tale of Benjamin Bunny resulted. 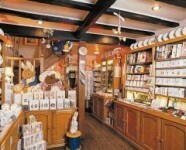 Beatrix Potter is honoured with an exhibition on her life and tableaux portraying scenes from her books at The World of Beatrix Potter in Bowness-on-Windermere. A little known side of Potter is showcased in Ambleside where the Armitt Trust displays her botanical drawings and paintings alongside those of other British writers and painters. Potter said, “Thank goodness I was never sent to school; it would have rubbed off some of the originality.” How fortunate for all of us that her environment provided a place for her love of art, nature, and animals to flourish. When she died in 1943, Potter left fourteen farms, 4000 acres of land, and her Herdwick sheep to the National Trust. Beatrix Potter was an author, artist, countrywoman, and strong supporter of the Lake District. The year 2002 celebrating the centenary of her best known book, Peter Rabbit reminds us that her timeless stories, like her Lakeland legacies, will live always. The World of Beatrix Potter"
The home belonged to Potter’s uncle, and she used the kitchen garden as the setting for The Tale of the Flopsy Bunnies™. Collection of 25 of Beatrix Potter’s watercolour studies of fungi.